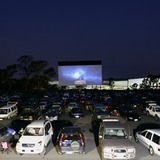 Lunar Drive-In Cinema - Melbourne - by Anna M.
The Lunar Drive-In Theatre in Dandenong is the biggest drive-in cinema in the country, with three huge screens showing new release movies every night. Found on the same site under different guises since 1956, before reopening in 2002 as the Lunar Drive-In, the theatre is bringing the drive-in experience to a whole new generation. Get a carload together, bring your family and friends (even the dog) and make a night of it. Here the atmosphere and cinematic experience is entirely up to you. Without being confined to an assigned seat, stretch out in the comfort of your own car any way you like. Bring pillows and blankets, watch from the front seat, lie back, or even reverse-park and enjoy the film from your boot. Tune your radio to the station printed on your ticket to pick up the sound, and have complete control of the volume. If the popcorn is getting low, visit the café for a quick snack and have the freedom to move around without disrupting others. A trip to the Lunar Drive-In is cheaper than going to your regular cinema. Tickets are $13 for adults, $11 concession, $9 for kids, under 3's go free and $28 for a carload. Single and double features are screened, as well as early, family sessions and cheaper, late night sessions. A range of popular movies are shown each night, with films and times changing every week or so. A list of current films and session times can be found here. Usually gates open a half hour before screening begins, or an hour before for weekends and busy times. For those extra popular films it is best to arrive early to get through the gates and secure your spot. The Lunar Drive-In is open in all types of weather, except heavy fog. Why? Not your regular trip to the movies. More articles by Anna M.
View all articles by Anna M.
I love the drive in, we used to go when we were teenagers and it was a fun thing to do. The way they have bought the character back into the drive in theatres is great and the prices are excellent.